INKOMA-screw jacks with oil lubrication and cooling fins add a new dimension to the scope and range of the INKOMA-GROUP screw jacks programme. They guarantee optimum operation even in extreme situations. 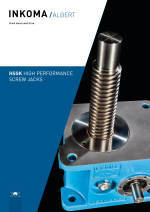 INKOMA-HSGK-screw jacks are extremely robustly designed. Carefully chosen materials and high quality manufacture provide an outstanding drive unit. The gear housing is in quality grey cast iron. Fixing faces are precisely machined, oil level indicator and ventilation screw are recessed. To achieve optimum heat dissipation the surface area is enhanced by cooling fins orientated with the spindle. The lifting spindle, whether trapezoidal or ballscrew, is driven by the worm wheel via hardened and ground gears having optimal geometry. Needle rollers rather than plain bushes support the radial loads on the lifting spindle. These features ensure an increase in life and performance over conventional designs. Input speeds of up to 3000 1/min are possible and both compressive and tensile loads up to 1000 kN can be carried. The INKOMA-HSGK-screw jack can, of course, also be equipped with a wide range of suitable accessories from our range. If you have questions or problems in respect of our product; e.g. loading, special designs, corrosion resisting versions, or modified housing please contact us and take advantage of our experience in jacking systems design.